Challenge: Boehringer Ingelheim needed 3,000+ instruments removed across 40 labs and 4 buildings. They also required additional services, including chemical removal, decontamination, packing, and shipping, all within an 8-week timeframe. In addition, several instruments needed to be redeployed to other locations in Austria and Germany. Solution: This organization partnered with American Laboratory Trading to manage the entire project. ALT’s services included the entire project management: valuation of instrumentation, cataloging, deinstallation, packaging, and shipping the +3,000 instruments. Based on equipment condition and a professional market assessment, the instruments were given a valuation of over $10 million. ALT purchased the equipment in cash and the customer received their payment within 30 days. Outcome: Boehringer Ingelheim was able to utilize the capital from this project to restructure their R&D program and create a leaner, global discovery research organization. Challenge: BP Biofuels needed to shut down a biofuels research hub with 50,000 square feet of lab space. Due to strategy-related changes in their approach to biofuels production, the company made the decision to close various facilities, including a research hub in San Diego, California. Solution: The company partnered with American Laboratory Trading to manage the project. ALT’s services included: cataloging and barcoding each instrument, reconciling the inventory with company records, decontaminating, decommissioning, packing, shipping, and storing offsite over 1,000 pieces of equipment. After ALT moved and stored all equipment, the facility was thoroughly cleaned. 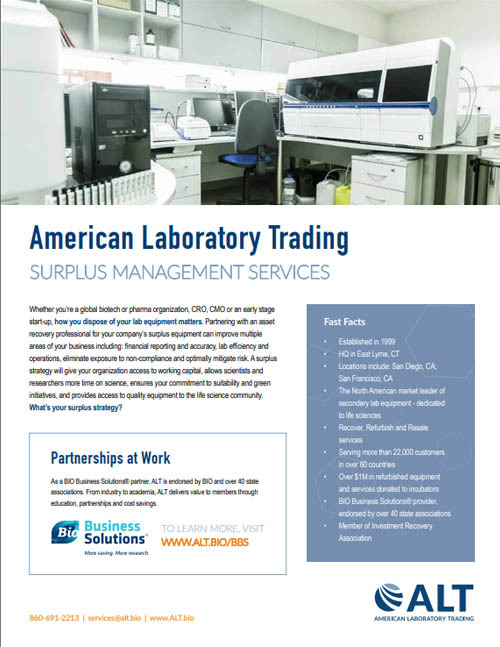 Upon redeploying as much equipment as possible to other facilities, the company was left with a large number of instruments in their 50,000 square feet of lab space, including: NMRs, HPLCs, FPLC, QPix colony picker, Chemspeed lab automation system, and a large number of bioreactors, from 10L to 300L. After a complete asset evaluation, the equipment was assessed a market value of $4M. 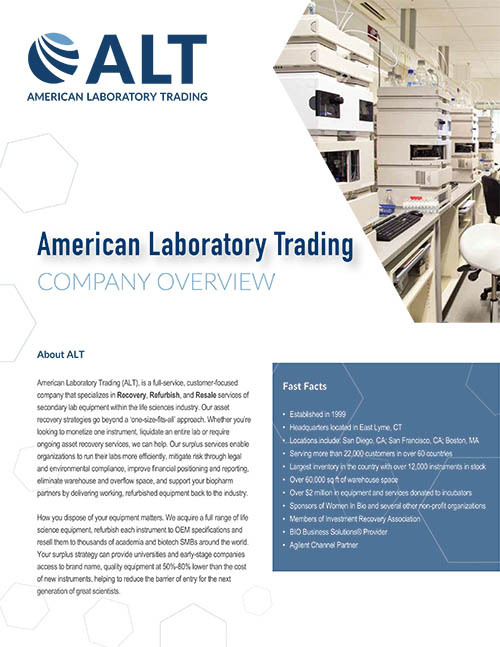 American Laboratory Trading purchased the equipment outright. Outcome: BP Biofuels was able to partner with a single vendor to handle the entire equipment disposition process. The proceeds were used to launch a spin-off company in a new facility.